I love the tartness of the cherries and of course the chocolate doesn't hurt but by no means do you need to use chocolate. Change the ingredients to whatever you like. 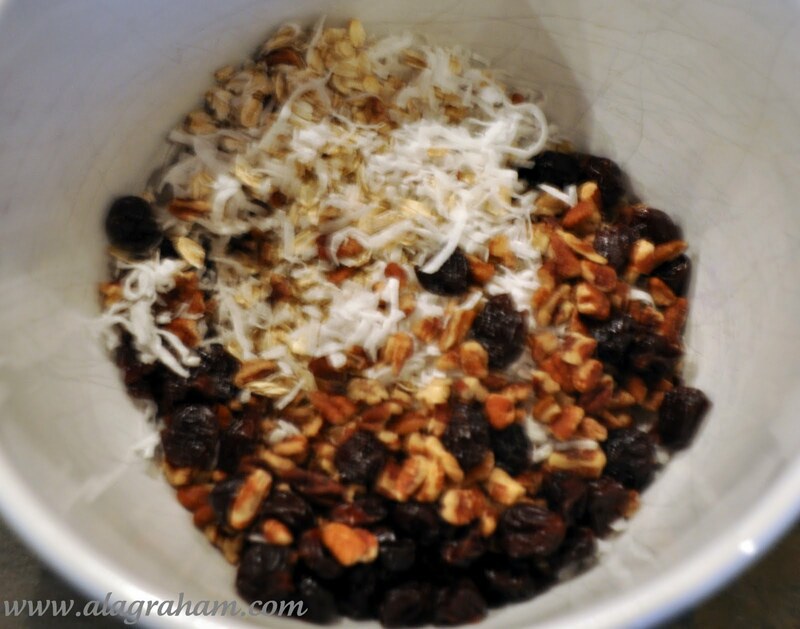 Raid your pantry; try sunflower seeds, dried figs, raisins, almonds, mixed nuts, etc. 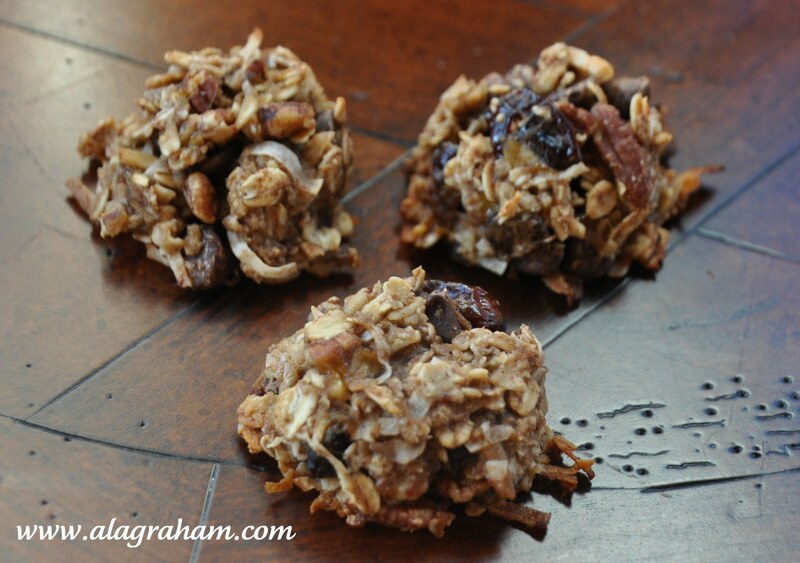 They are super healthy; chewy and filling. The best part is my children believe they are having a real treat and they love them! BANANA "SORBET / ICE CREAM"
Note: I would recommend chopping everything so it is about the same size and binds together nicely. In a large bowl, combine rolled oats, coconut flakes, cherries, pecans and chocolate chips. Stir in allspice and cinnamon and mix evenly. In another bowl, combine canola oil, mashed banana and vanilla extract. Pour wet ingredients over dry ingredients and stir until combined. Now take a cookie scoop and press the batter into the scoop and drop on cookie sheet. It should stay together. You can press it into a round cookie cutter if you prefer or even make bars and spread it evenly across the pan. I used a cookie scoop. Remove cookie cutter. Bake for about 20 minutes or until edges are golden brown. These cookies are great for being lunch box fillers. 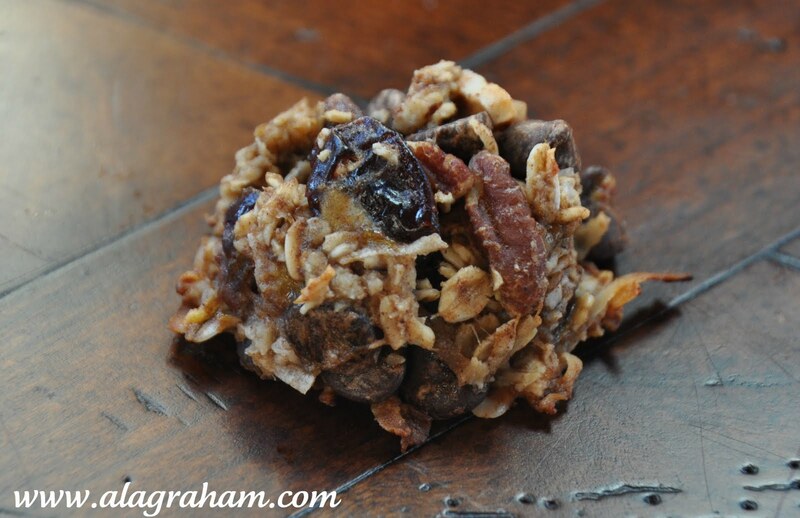 I would love to try baking these healthy treats. How do I get to your most recent post? Zoe- yes, exactly what I was thinking, for school lunch or breakfast on the go (less the chocolate)! Anon- Easiest way is to click on the large pink a la graham photo/logo at the very top of this page and it will always bring you to the most recent post. Or there is also a blog archive on the right hand side. These cookies are great for those who are gluten-free etc. Thanks for sharing. As long as I remove the nuts my son would be able to eat these.